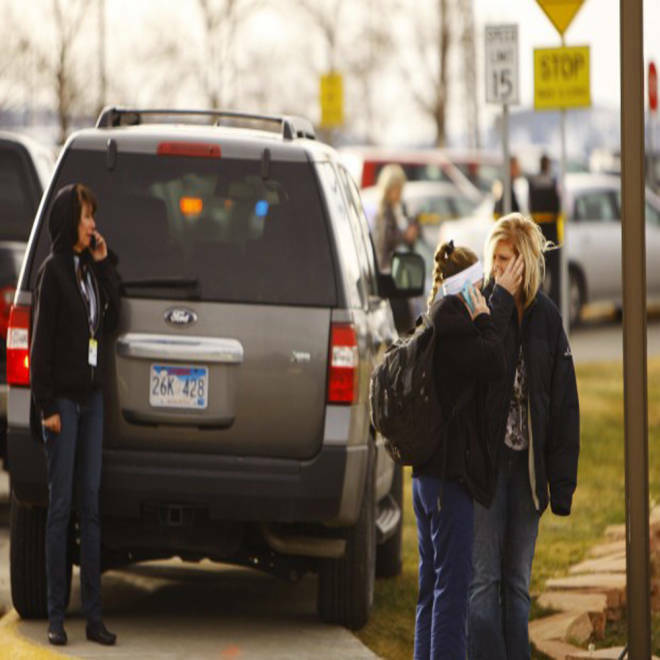 Students and faculty mingle outside the police line on the Casper College campus Friday, Nov. 30, as police investigate a homicide. Updated at 7:11 p.m. ET: A man killed a woman in Casper, Wyo., on Friday and then headed to the campus of Casper College, where he killed a man in front of students during a science class before killing himself, police said. The man used "an edged weapon" — earlier described by police, college officials and eyewitnesses as a "bow and arrow-type" weapon — in all three killings, including his own suicide, Casper Police Chief Chris Walsh said. Walsh wouldn't identify any of the victims, including the killer, pending notification of their families. College officials said the man who was targeted in the classroom was a faculty member, whom they also wouldn't immediately identify. Walsh did say that all three victims were adults who knew one another and that the killer wasn't a current student at the college. The incident didn't appear college-related, he said. The man appeared to have acted alone. "There is no one at large, and there is no threat of violence," Walsh said Wednesday afternoon. Police found the two men on the third floor of the community college's physical science center, where they had been called to investigate a "traumatic injury" at about 9 a.m. (11 a.m. ET), Walsh said. Shortly after they arrived, they received a similar call involving an address about two miles from campus, where they found the dead woman. All told, 33 local, state and federal officers responded at the campus, which was locked down temporarily while police checked for other suspects, authorities said. An alert on the community college's website said that all classes and activities had been canceled and that counselors were being provided for the colleges faculty, students and staff. Casper College is a two-year community college of 4,400 students in Wyoming's second-largest city. The school has a small security team on campus, but they're not armed. "It's such a small town that Casper police is very close," Fujita said.